Sister M. Vera Ochmanowicz, C.S.F.N. 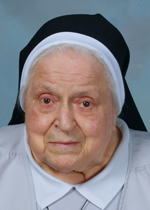 Sister M. Vera (Ceslas) Ochmanowicz, C.S.F.N., died Dec. 31 at Jesus of Nazareth (Mount Nazareth) Convent in Philadelphia at age 97. She was in the 76th year of her religious life. Born to Casimir and Rose Ochmanowicz on Dec. 27, 1921 in the Bridesburg section of Philadelphia, she attended St. John Cantius School and Nazareth Academy High School. She entered the Sisters of the Holy Family of Nazareth in 1942 and professed final vows in 1951. To prepare for her 41-year teaching ministry, she trained at Holy Family Teacher Training School and Villanova College, where she earned a B.S. in secondary education. She taught in elementary schools in Philadelphia, Ambler and Brooklyn, N.Y. She also taught high school in Hato Rey, Puerto Rico. Additionally, she served as administrator at Mount Nazareth in Philadelphia. Sister Vera was known for her prayerful presence and had the gift for making everyone feel special. In retirement, she made beautiful crocheted creations for the convent’s gift shop and had a talent for growing violets. She was also an avid Phillies fan. The funeral Mass for Sister Vera was celebrated Jan. 4 at Mount Nazareth Chapel in Philadelphia. Donations in her memory may be made to Sisters of the Holy Family of Nazareth, 310 N. River Road, Des Plaines, IL 60016.